Ross-Simons has got these Cultured Pearl Cluster Drop Earrings in 14-karat yellow gold for $69.00 with free shipping (use promo code WELCOME at checkout to get the free shipping). Description: Bubbly clusters of petite 3-4mm cultured freshwater pearls dangle to a demure 1 3/4" for a chic pearl look made modern. Set in 14kt yellow gold. 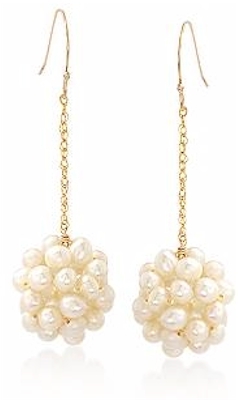 earwire, pearl cluster drop earrings.